Toronto faced some pretty serious weather this past week. After two days and 30mm of freezing rain, the city was covered in a thick layer of ice. Days before Christmas, ice built up on branches and wires in record thickness, and across the city trees fell, taking down hundreds of power and telephone wires, and leaving some in the cold. Thousands of residents were without power, all on the first official day of winter. Couldn't ask for worse timing for a storm like this. And while our neck of the woods only lost water for a few hours, my father-in-law was one of the unlucky ones, remaining without power for almost 120 hours. The fact that an emergency situation such as this could happen so close to home was a huge eye opener and really got me thinking about emergency planning and preparedness. And while you hope it never happens to you, knowing what to do is an important part of being prepared. Creating an emergency plan takes only 20 minutes of your time and is the difference between acting to keep your family safe in an emergency. Keep the plan in a safe location and review it annually with your family. 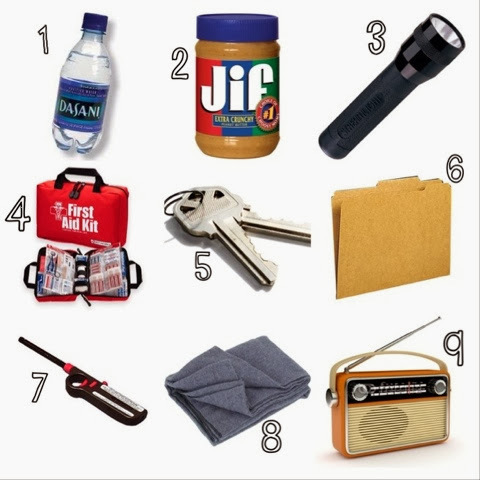 Do you have a family emergency plan/kit? A huge THANK YOU to all of the out-of-town and -province hydro workers who scarified their Christmases in order to help the families of Toronto be able to celebrate theirs. My dad lost his power for 5 days and he said the one thing he wished he had was a battery operated radio. He had to go to the car a lot to see what was going on! He also dropped his flashlight and the batteries fell out. He couldnt find them at all in the dark so he was grateful for a second one! I am so glad that I didn't lose power during this past ice storm. I was in my teens when there was a huge ice storm that hit northern NY and Quebec. We lost power for 18 days because my family lived in a rural area that was hit hard, but fortunately we were prepared with supplies and we already had a wood stove which could provide heat/light/source to cook on. I recommend to everyone to invest in an "emergency" radio. They are about 70 dollars, but they don't need electric or batteries to run. You just crank the dial for a few minutes and get over an hour of usage - my radio has all the NOAA stations built in, as wells as a plug to charge my cell phone, and a flashlight.